It is very important to backup your contacts in Gmail. The method explained in this post allows a user to migrate existing Gmail contacts to a different email service like Yahoo mail. 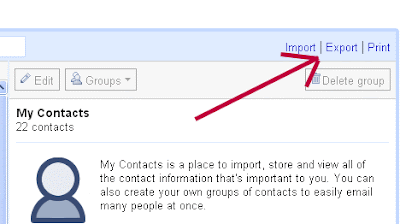 How to backup contacts in Gmail? 2. Click on Contacts at the left. 4. Select Outlook CSV option, click Export button and save the contacts.csv on your computer. How to import contacts from other email providers like Gmail and Live to Yahoo email service? 1. Go to Yahoo Transfer Contact service. Note: We can also upload the contacts from the contacts.csv file, we got from Gmail previously!